Who’s ready for some football?! 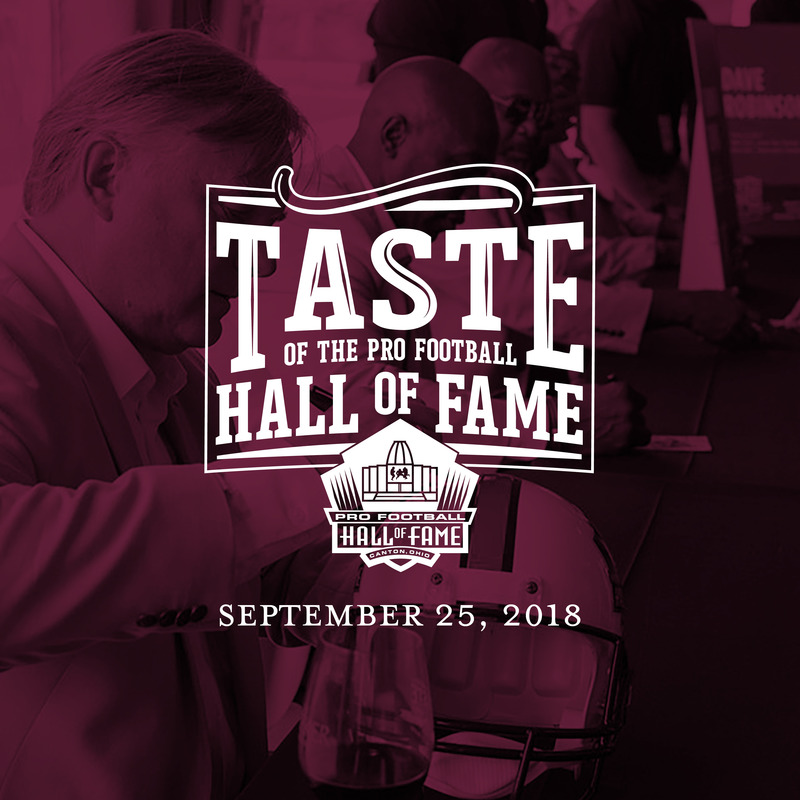 The 11th annual Taste of the Pro Football Hall of Fame, benefiting the Akron-Canton Regional Foodbank, will be held on Sept. 25, 2018 from 5:30pm-9:00pm at the Pro Football Hall of Fame in Canton. Taste of the Pro Football Hall of Fame is an evening in which guests will have the opportunity to experience fine cuisine and beverages from more than 20 local restaurants as well as local breweries and national wineries. The event strives to support hunger-relief efforts in Northeast Ohio by raising funds and awareness regarding hunger in the Foodbank’s eight-county service area. At the event, Hall of Fame Gold Jackets including Robert Brazile, Walter Jones, Bruce Matthews and Will Shields will be dressed in their iconic gold jackets mingling and signing autographs for guests in attendance. This year the event will take place in a new location, the North Concourse of Tom Benson Hall of Fame Stadium. Two new exclusive tours have been added for guests’ enjoyment, including the John Madden Cruiser Tour and a tour of the Tom Benson Hall of Fame Stadium. Purveyors at this year’s Taste of the Pro Football Hall of Fame include (bolded names are new to the event): BOMBA Tacos & Rum, The Canton Brewing Company, Caston & Main Brew Yard, Chocolates by Erin, Cilantro Thai & Sushi Restaurant, Dunkin' Donuts, Gervasi Vineyard, Hoppin’ Frog Brewery, Main Street Gourmet, Meeker Wines distributed by Esber Beverage, Melt Bar and Grilled, Pav's Creamery & HiHo Brewing, Pepsi, The Raging Avocado, The Rail, Robert J. Events & Catering, Saffron Patch in the Valley, SHY Cellars, Streetside/Whiskey Alley, Tozzi's of Magnolia, Troutman Vineyards, The West Side Bakery and The Winery at Wolf Creek. Live and silent auctions at the event will feature items like a ride on the Goodyear Blimp and a trip to Palm Desert Resort and Country Club in California. Want to bid on items before the event? The interactive auction website will be live on Sept. 18, 2018 at akroncantonfoodbank.org/taste. Tickets are $150 for general admission and $250 for VIP admission, including VIP lounge access, early admittance, exclusive meet and greet opportunity with Hall of Fame Gold Jackets, recognition in event program and a commemorative photo. Young professionals can attend the event at the discounted rate of $100. Tickets can be purchased at akroncantonfoodbank.org/taste or by calling 330.535.6900. A special thank you to our Taste of the Pro Football Hall of Fame presenting sponsors Citizens Bank and WQMX/WONE/WAKR/WNWV.